What's a degu? It's a cute, furry rodent, native to Chile, that is becoming more popular as a pet. 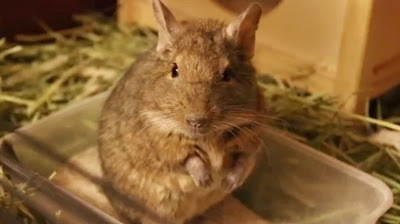 Degus are about the size of a medium guinea pig. To me, they kind of look like miniature capybaras. And apparently, they really enjoy bathing in sand. Degu owners always provide a little sandbox for them to frolic in and roll around in.